Smoking or tobacco use is responsible for the creation of more than 30% of all cancers, which predominantly affect the upper aerodigestive tract including the lung and bronchus, larynx, pharynx and oral cavity. The anti-cancer, cancer prevention and antimetastatic potential of curcumin has been established through multiple animal studies and cancer cells cultures. Curcumin is a multipotent natural compound that induces apoptosis, inhibits survival signals, scavenges reactive oxidative species (ROS), and reduces the inflammatory cancer microenvironment depending on the study context. Tobacco-related malignancies result from the activation of oncogenic pathways such as EGFR, K-RAS and H-RAS, PI3K-CA etc . Tremendous advances have been made over last few decades in the field of cancer prevention and therapy and the number of cancer survivors has increased from 3 million in 1971 to 13.7 million in 2012 (AACR Cancer Progress Report, 2013). Unfortunatly most of the available currently used drugs are highly toxic. On the other hand, natural dietary compounds which exist in fruits, vegetables and spices are used over centuries for various therapeutic purposes and are recognised as safe, because they are consumed over centuries. Extensive research over the past several decades has identified numerous dietary and botanical natural compounds that have anti-cancer or cancer preventive or antimetastatic effects effects . Unlike chemotherapy and molecularly targeted agents, the natural compounds demonstrate safety and anticancer activity through multiple signal transduction pathways without side effects. Because of their safety, low toxicity, antioxidant properties, and general acceptance as dietary supplements, fruits, vegetables, and other dietary elements (phytochemicals and minerals) are being investigated for cancer treatment, prevention of cancer and cancer metastases treatment. The multi-targeted effect of phytochemicals is desired for the prevention and therapy of multi-factorial diseases such as cancer, which involves complex interactions between multiple signal transduction pathways. Among the thousands of natural compounds initially tested for their anti-cancer potential, only about 40 promising agents have been moved to clinical trials. The most investigated phytochemical the last ten years is curcumin. Curcumin is a naturally occurring yellow pigment that is derived from the rhizome of Curcuma longa. It modulates multiple molecular pathways involved in the lengthy carcinogenesis process to exert its chemopreventive effects through several mechanisms: promoting apoptosis, inhibiting survival signals, scavenging reactive oxidative species (ROS), and reducing the inflammatory cancer microenvironment. Curcumin fulfills the characteristics for an ideal chemopreventive agent with its low toxicity, affordability, and easy accessibility . The anti-cancer potential of curcumin has been established through multiple animal studies. Curcumin was found to significantly decrease the initiation of 7,12-dimethylbenz-[a]-anthracene (DMBA)-induced mammary adenocarcinoma in female rats by its intraperitoneal infusion 4 days before DMBA administration . On the other hand, the chemopreventive effect of curcumin on N-nitrosomethylbenzylamine-induced esophageal carcinogenesis in rats was observed not only in the initiation phase but also in post-initiation phases . Curcumin was also reported to prevent colon cancer development in C57Bl/6J Min/+ mice with APC mutation  and N-nitrosodiethylamine and phenobarbital-induced hepatic cancer in rats and reduced lipid peroxidation and salvaged hepatic glutathione antioxidant defense . Like many other natural compounds, curcumin modulates multiple signal transduction pathways involved in the lengthy carcinogenesis process and induces apoptosis (programmed cell death), inhibits survival signals, scavenges reactive oxidative species (ROS), and reduces the inflammatory cancer microenvironment depending on the study context . The AKT serine-threonine kinases are common downstream effectors of these oncogenic pathways and are critical for tumorigenesis . The mammalian serine/threonine Akt kinases comprise three closely related isoforms: Akt1, Akt2 and Akt3. Akt activation has been implicated in both normal and disease processes, including in development and metabolism, as well as cancer and cardiovascular disease . It was previously reported that curcumin inhibited phosphorylated AKT in many cancer types (AKT is one of the most actively studied kinases in both basic research and drug development). Consistent with these reports, it was also found that curcumin strongly inhibited phosphorylated AKT in tobacco-related cancer cell lines. Amin AR1, et al (2015) investigated the mechanism of curcumin-induced apoptosis in upper aerodigestive tract (lung and head and neck) cancer cell lines and showed that curcumin inhibited survival signals (p-AKT and Bcl-2), the reversal of which protected cells . On the other hand, curcumin activated tumor suppressor pathways such as p73, inactivation of which also protected cells from curcumin-induced apoptosis. Recently, the potential use of curcumin in cancer prevention and therapy urges studies to uncover the molecular mechanisms associated with its anti-tumor effects . Amin AR1, et al (2015) investigated the mechanism of curcumin-induced apoptosis in upper aerodigestive tract cancer cell lines and showed that curcumin-induced apoptosis is mediated by the modulation of multiple pathways such as induction of p73, and inhibition of p-AKT and Bcl-2 . Curcumin induces p73-dependent but p53-independent apoptosis. Treatment of cells with curcumin induced both p53 and the related protein p73 in head and neck and lung cancer cell lines. The p53 family consists of three structurally and functionally closely related proteins, p53, p63 and p73, functionally classified as transcription factors and tumor suppressors, which play a critical role in apoptosis . Curcumin induces inactivation of p73 by dominant negative p73 significantly protected cells from curcumin-induced apoptosis, but ablation of p53 by shRNA had no effect . Most aerodigestive tract malignancies are initiated by oncogene activation, and the subsequent activation of AKT through phosphorylation by these oncogenes is a major and common downstream event. Defects in apoptotic pathways can promote cancer cell survival and also confer resistance to antineoplastic drugs. Curcumin treatment also strongly inhibited p-AKT and Bcl-2 and overexpression of constitutively active AKT or Bcl-2 significantly inhibited curcumin-induced apoptosis . One pathway being targeted for antineoplastic therapy is the anti-apoptotic B-cell lymphoma-2 (Bcl-2) family of proteins (Bcl-2, Bcl-XL, Bcl-w, Mcl-1, Bfl1/A-1, and Bcl-B) that bind to and inactivate BH3-domain pro-apoptotic proteins. Signals transmitted by cellular damage (including antineoplastic drugs) or cytokine deprivation can initiate apoptosis via the intrinsic apoptotic pathway . Bcl-2 is one of the most potent anti-apoptotic proteins; it is overexpressed in many types of human tumors and protects cells from mitochondria-mediated apoptosis induced by a wide variety of stimuli, including chemotherapeutic drugs and gamma-irradiation . Curcumin induces mitochondria-mediated apoptosis as evidenced by the release of cytochrome C in the cytoplasm. Treatment of both SCCHN and lung cancer cell lines with curcumin strongly inhibited the expression of Bcl-2 in all cell lines tested. Taken together, their findings suggest that curcumin-induced apoptosis is mediated via activating tumor suppressor p73 and inhibiting p-AKT and Bcl-2. In spite the fact that curcumin demonstrates anticancer, cancer precentive and antimetastatic effects in cancer cells cultures and experimental animals, it suffers from the limitation of poor solubility and low dissolution that can lead to limited therapeutical anticancer applications in humans. This is because curcumin undergoes rapid oxidative degradation at physiological conditions resulting in poor stability and bio-availability . Even when very high dose of native curcumin are administered orally, only very small amounts of free curcumin reach the blood circulation and the targeted organs. The oral bioavailability of curcumin significantly improved after the creation of several curcumin formulations without altering safety parameters. Those formulations are ideally suited to deliver curcumin in human intervention clinical trials against several cancer. Schiborr C et al (2014) demonstrated that the micronized powder (curcumin micronisate) and particular the liquid micellar formulation of curcumin (curcumin micelles) significantly improved the bioavailability of curcumin without altering safety parameters and may thus be ideal suited to deliver curcumin in human intervention clinical trials . According to pharmacokinetic data for novel oral delivery systems, namely the concomitant administration of the adjuvant piperine with curcumin and the application of crystalline curcumin in a micronized form (curcumin micronisate) suggest an ~20- and ~ 28 fold increase in bioavailability of curcumin (based on area under the plasma concentration-time curve (AUC) or 2000% and 2800%, compared to native curcumin, respectively [13, 14]. The micellar delivery system of curcumin (curcumin micelles) enhances curcumin bioavailability 185-fold increase (based on area under the plasma concentration-time curve (AUC) or 18.500%. This is the curcumin formulation reported, until now, in the international literature, with highest bioavailabilty.This provides significant opportunities to truly utilize curcumin’s properties to maximum effect. Curcumin is transformed into its most bioavailable form, the liquid curcumin micelles through the unique technology NovaSOL® wich is available in Licaps capsules circulate as dietary supplement, under the comercial name Curcugkel. As demonstrated in a human clinical trial the curcumin micelles of Curcugkel show the superior bioavailability of over a standard curcumin extract . The liquid NovaSOL® Curcumin (Curcugkel) is a very stable, highly bioavailable solubilisate that enhances the effect and the multiple health benefits of curcumin and is effective at much lower dosages. The material results in a clear yellow solution in both water and oil due to its unique micelle structure. 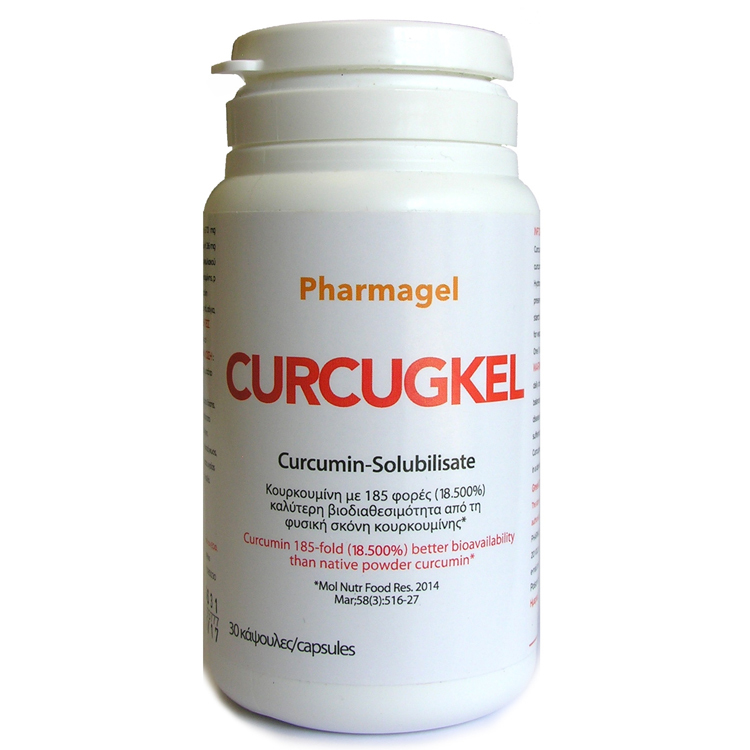 One caps (Licaps) of Curcugkel contains 670 mg of liquid solubilisate of curcumin extract, with active curcuminoids: Min. 6%. (equivalent to approx. 8 gr standard curcumin 95%). The usual daily dose is one caps. Curcugkel can be sent internationally communicating with pharmage@otenet.gr in the price of 24.27 Euros. 1. Amin AR1, Haque A1, Rahman MA1, Chen ZG1, Khuri FR1, Shin DM1. Curcumin induces apoptosis of upper aerodigestive tract cancer cells by targeting multiple pathways. PLoS One. 2015 Apr 24;10(4):e0124218. 2. Yu H1, Littlewood T2, Bennett M3. Akt isoforms in vascular disease. Vascul Pharmacol. 2015 Apr 28. pii: S1537-1891(15)00039-7. 3. Newton AC1, Trotman LC. Turning off AKT: PHLPP as a drug target. Annu Rev Pharmacol Toxicol. 2014;54:537-58. doi: 10.1146/annurev-pharmtox-011112-140338. 4. Amin AR1, Kucuk O, Khuri FR, Shin DM. Perspectives for cancer prevention with natural compounds. J Clin Oncol. 2009 Jun 1;27(16):2712-25. 5. Park W1, Amin AR, Chen ZG, Shin DM. New perspectives of curcumin in cancer prevention. Cancer Prev Res (Phila). 2013 May;6(5):387-400. 9. Botchkarev VA1, Flores ER2. p53/p63/p73 in the epidermis in health and disease. Cold Spring Harb Perspect Med. 2014 Aug 1;4(8). pii: a015248. 10. Kang MH1, Reynolds CP. Bcl-2 inhibitors: targeting mitochondrial apoptotic pathways in cancer therapy. Clin Cancer Res. 2009 Feb 15;15(4):1126-32. 11. Thangavel S1, Yoshitomi T1, Sakharkar MK2, Nagasaki Y3. Redox nanoparticles inhibit curcumin oxidative degradation and enhance its therapeutic effect on prostate cancer. J Control Release. 2015 Apr 22;209:110-119. 12. Schiborr C1, Kocher A, Behnam D, Jandasek J, Toelstede S, Frank J. The oral bioavailability of curcumin from micronized powder and liquid micelles is significantly increased in healthy humans and differs between sexes. Mol Nutr Food Res. 2014 Mar;58(3):516-27. 13. Shoba G, Joy D, Joseph T, Majeed M, Rajendran R, Srinivas PS. Influence of piperine on the pharmacokinetics of curcumin in animals and human volunteers. Planta Med. 1998 May;64(4):353-6. 14. Sasaki H1, Sunagawa Y, Takahashi K, Imaizumi A, Fukuda H, Hashimoto T, Wada H, Katanasaka Y, Kakeya H, Fujita M, Hasegawa K, Morimoto T. Innovative preparation of curcumin for improved oral bioavailability. Biol Pharm Bull. 2011;34(5):660-5.